The shoes I required were not available at Antrim Store. The most helpful lady named Yvonne, I think went above and beyond the call of duty to check with other Shoe zone stores for availability and managed to find and reserve for me. I was extremely pleased with her excellent customer service and lovely manner. I was very disappointed in your Manager as I had to returned a pair of Mules that had a fault, the top of the mule stretched and I was unable to wear them as my foot slipped out of the mule at the front . I was only able to wear them once for a short distance .and also there was a break in one of them about half a inch. She maintained it was not a manufacture fault. I was so disgusted I just went and left them into a charity shop. My Husband and myself get quite a lot of shoes /sandals/ slippers in your shops but I will not be giving my custom from now on. Last week, I received a pair of shoes as a gift, purchased in the Castle Street branch: the purchaser thought they were leather, but they were not, nor were they really my style. So this morning, I popped into the Antrim branch for an exchange. The member of staff was very helpful and immediately retrieved my choice & size of shoe from the display racks. Job done in less than ten minutes, as no charge for the NCP car parking! 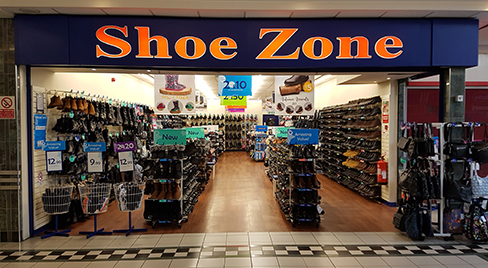 Five stars for Antrim Shoe Zone.